I decided to take a cab to Penn Station last night. As usual, the cab had that intangible odor that wasn’t pleasant, but not unpleasant enough to make one get out and brave the 15 minute walk in cold darkness. On the ride down 8th Avenue, past the few erotica stores mixed in with raw juiceries, you can look up into the pane glass windows of the apartments that rise above the bodegas and Duane Reades. For the most part, all you can see are shadows of large rubber tree plants and modern lamps, their owners most likely making the same slow journey as I toward their sanctuaries. But every once in a while, instead of shadows of plants and lamps, you will catch the flickering glow of an apartment where someone is watching television, the fuzzy random shadows that cast across the walls colliding with the raucous city outside. I always wonder what the story is behind the person in that apartment, if there is even a person at home or if they left the television on. Do they have the flu and are snuggled down deep into the cushions of their sofa wrapped up in an afghan their mother in law knit for them? Maybe there are two teenagers home alone from school watching ABC Family or a horror movie, popcorn littering the Design Within Reach area rug beneath them, or perhaps a broken hearted sufferer who couldn’t bear to leave the sanctuary of their small place in the world, relying on reality television to escape the pain of their latest break up or loss. I guess it might be odd to say that I think of television as more than what comes across the screen for me to watch. There is a comfort in the very act of just having it on sometimes. I know I am a 36 year old privileged white suburban mom who is supposed to scoff at all mainstream television in exchange for a constant stream of This American Life and Wait Wait Don’t Tell Me on NPR, but there is still a place in my heart for this influential invention, the television. Not so much because of a need to watch Bravo schlock and Downton Abbey, but because of the comfort it provides at different times and for different people. It goes back as far as my early years when I used to sleep at my grandma’s house. She was the type to sleep with the tv on and I remember being 5 years old in her bed with the pink and yellow neon flower sheets watching old Dragnet episodes on her small yellow plastic, black and white console that sat on the dresser, casting those same peaceful shadows I noticed last night during my cab ride. They were a sense of comfort to me even back then, those shadows and her low, nasal snore. I wonder if she knew that I never really slept a wink. I still remember the hours I counted down until Hot Fudge came on and I knew it was Sunday morning. Or years later when we watched for days the Twin Towers collapsing, asking ourselves over and over whether what we were watching was real. Those days weren’t about peace or sanctuary, but the stark reality of the changing world we were living in. During times of tragedy, television is our connection to those suffering elsewhere, a reality check in case we forget how horrible the world can be at times. It’s true to say that without television we would probably be happier since we wouldn’t be aware of all of the evil in the world and some people ban television in their home entirely because of this fact alone. Television is most appropriate as a backdrop, as an accent to our lives. It’s when television becomes more than that, that it becomes dangerous and not so good for us. Like everything else in life, used in moderation, it is a beautiful, enriching thing, a tool for providing rich memories – like Sunday football gatherings. A stronghold in times of uncertainty, like on 9/11. It shouldn’t be used in place of parenting or a long term escape from an unpleasant reality, but I don’t think it is inherently evil. Television is like a bag of delicious potato chips. Some days, you can eat 3 and walk away because you’ve got a handle on life and you’re feeling good. Other days you eat the whole bag because you had a bad day at work. 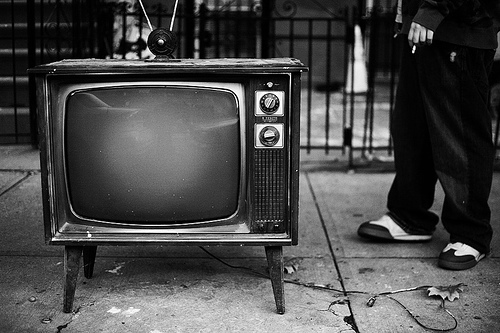 The way we use television is a reflection of who we are at the moment and what we are going through. Sometimes we need to be alone, with that low flickering light, curled up under an afghan with a pint of ice cream, pretending we’re friends with people we will never meet on screen while still maintaining the sanctuary of solitude. Television allows the illusion of friendship, when all we want is to be alone, safety while we tend to our voyeuristic nature in viewing life’s disasters and the illusion of safety with its flickering glow casting moving shadows on dark walls that others watch through windows and question what the story is behind them.